St. Athanasius, and the friend of the great St. Anthony, died at the advanced age of ninety, after passing sixty years in the desert. 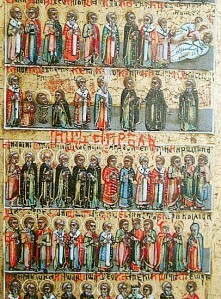 Martyrs of the Diocletian persecution around A.D. 304. Roman; Pope and personal friend of St. Jerome; he succeeded Liberius in the chair of Rome; he defended with vigor the Catholic faith. Also known as Vincent Martyr, deacon of Saragossa in the former Kingdom of Aragon, Spain, who was tortured and drowned in A.D. 305 under the Emperor Diocletian. Appointed bishop in 300, martyred in 311; he headed the catechetical school at Alexandria. Eusebius calls this great prelate the excellent doctor of the Christian religion, and the chief and divine ornament of bishops; and tells us that he was admirable both for his extraordinary virtue and for his skill in the sciences and profound knowledge of the Holy Scriptures. An Early Christian apologist, during the reign of Diocletian (A.D. 284-305), the master of Lactantius: he was a distinguished rhetorician who taught rhetoric at Sicca, in Numidia, at the end of the third or beginning of the fourth century. He has left us seven books against the Pagans. Roman; successor to Pope St. Mark and Pope from A.D. 337-352, chiefly known by the part he took in the Arian controversy. Bishop of Nisibis in Mesopotamia, was present at the council of Nicaea, and died about the year 361. We have his life by Theodoret of Cyrus. A. Antonelli published eighteen sermons by this saint at Rome in 1756. Bishop of Barcelona, Jerome praises his eloquence, learning, chastity, and holiness of life. He is also remembered from a phrase from one of his letters: "My name is Christian, my surname is Catholic.". Flourished in 385, a disciple of St. Athanasius, whose see he obtained. He was present at the Council of Constantinople, held in 381. Alexandrian; though born blind, he amassed a vast knowledge of grammar, rhetoric, logic, music, arithmetic, and geometry, and a perfect familiarity with Holy Scripture. Of his numerous writings but few remain. French; husband, theologian, bishop of Poiters around A.D. 355, and Doctor of the Church. Referred to as the "Hammer of the Arians" and the "Athanasius of the West.". He was obviously a firm supporter of St. Athanasius. Palestinian; ordained by Maximus, he was made bishop of Jerusalem in A.D. 345; scholar and Doctor of the Church. None of his writings have been preserved to us, except eighteen catechetical instructions addressed to catechumens, and five mystagogic discourses addressed to neophytes. Cappadocian; archbishop, theologian, Doctor of the Church. A fourth-century Roman historian. He wrote the penultimate major historical account surviving from Antiquity, His work chronicled in Latin the history of Rome from A.D. 96 to 378, although only the sections covering the period: A.D. 353-378, are extant. Cappadocian; bishop of Cæsarea in A.D. 369, theologian, monk. Studied in Palestine, Constantinople, and Athens. Many of the subsequent years of his life were spent in the deserts of Egypt and Libya. His character and works have gained for him the surname of "the great". French; bishop of Rouen (A.D. 393-407), missionary, and author, son of a Roman legionnaire, and was in the army himself. However, when he became a Christian, he refused to remain in the army. An active Pope, involved in the administration of the Church and the handling of various factions and viewpoints within it; author of two decrees concerning clerical celibacy. The decree of A.D. 385 stated that priests should stop cohabiting with their wives. Bishop of Nyssa in A.D. 371, an erudite theologian who made significant contributions to the doctrine of the Trinity and the Nicene creed. Gregory's philosophical writings were influenced by Origen. He was the brother of the great St. Basil. Bishop of Iconium, in the history of theology he occupies a place of prominence for his defence of the divinity of the Holy Spirit against the Macedonians. Dalmatian; born in Strido; priest, hermit, abbot, biblical scholar, translator and Doctor of the Church. In an age distinguished by men of the greatest eloquence and learning, St. Jerome, especially in all matters connected with the Sacred Scriptures, was then preeminent, and has probably never since been equalled. Syrian; archbishop, Doctor of the Church. Born at Antioch in 344; he was ordained priest in A.D. 383, and raised to the see of Constantinople in the year A.D. 398. His eloquence gained him the title of Chrysostom, or the mouth of gold. His expositions of Scripture, especially the Epistles of St. Paul, are very valuable. This illustrious prelate died on his road to exile, in A.D. 407. (Aurelius Prudentius Clemens) Roman Christian poet, born in the Roman province of Tarraconensis, now Northern Spain. He probably died in Spain, as well. The hymn Salvete, flores Martyrum, is by this writer. German; reluctantly made bishop in the A.D. 374., Doctor of the Church. He closed a great and glorious career in A.D. 396. We have his life by Paulinus. A Christian bishop, a monastic reformer, and a theologian. Born in Cappadocia, bishop of Amasea (A.D. 380-390), after having been a lawyer. Not to be confused with the Arian polemicist, Asterius the Sophist. Pope from (A.D. 401 to 417), he lost no opportunity in maintaining and extending the authority of the Roman See as the ultimate resort for the settlement of all disputes. Bishop of Mopsuestia in Cilicia and Ecclesiastical writer. A friend of St. Pachomius. Italian; he was raised to the see of Trent in 385 and is venerated as the patron saint and first bishop of Trent. St. Paulinus well says he was "meek as Moses, as priestly as Aaron, innocent as Samuel, tender as David, wise as Solomon, apostolic as Peter, loving as John, cautious as Thomas, brilliant as Stephen, fervent as Apollos." North African; born in Tagaste in A.D. 354, baptized in Milan in A.D. 387, ordained a priest in A.D. 391 and appointed bishop of Hippo in A.D. 395, Augustine is one of our greatest theologians. His numerous works display genius of the highest order, and have ever had great weight in the Christian churches. He is also a Doctor of the Church. a Christian theologian celebrated in both the Western and Eastern Churches for his mystical writings. He is known both as one of the "Scythian monks" and as one of the "Desert Fathers". His opinions on grace being in opposition somewhat to those of St. Augustine and the Church, caused him to be opposed by St. Prosper. A Christian writer and native of Aquitania. He is known for his chronicle of sacred history, as well as his biography of Saint Martin of Tours. Born in Galatia and the friend of St. John Chrysostom, whose life he wrote early in the fifth century. A disciple of Evagrius of Pontus and an admirer of Origen, he became, when twenty years of age, a monk on the Mount of Olives under a certain priest, Innocent. African; native, a Donatist of great learning, learned in theology, sufficiently instructed in history, not ignorant of secular knowledge. His best known work, the "Seven rules of interpretation" (for the Bible), is quoted and explained by St. Augustine who he appears to have had some influence on. He defended a milder form of Donatism than Parmenianus. Priest of Antioch, flourished at the close of the 4th and the beginning of the 5th century. Commented on Mark's Gospel. Spanish; a Christian historian, theologian, student and friend of Augustine of Hippo. He is best known for his "Seven Books of History Against the Pagans". His "History of the World" is valuable, and has been frequently translated. A British bishop, who flourished around A.D. 430, about the same times as St. Cyril of Alexandria, author of De Viduitate Servanda. Egyptian; bishop, theologian and Doctor of the Church. He succeeded Theophilus in the patriarchal see of Alexandria, in A.D. 412, and was the great champion of orthodoxy against Nestorius, against whom the general council of Ephesus was called, in A.D. 431 and in which St. Cyril presided. Bishop of Abbenza in North Africa. He was martyred in 457 when he refused to surrender the sacred vessels of his church to the Vandals led by Arian king Geiseric. Valerian was driven out of the city and left to die of exposure. Saint Reticius, bishop of Autun. Also known as Socrates Scholasticus, not to be confused with the Greek philosopher Socrates, was a Greek Christian church historian, a contemporary of Sozomen and Theodoret, who used his work; he was born at Constantinople A.D. c.380: His Ecclesiastical History is, for the most part, a continuation of that by Eusebius. It begins with the year 306, and closes with the year 439. A Christian writer and disciple of St. Augustine, as well as the friend and secretary of Pope Leo I. He was the first continuator of Jerome's Universal Chronicle. Prosper was a layman, but he threw himself with ardour into the religious controversies of his day, defending Augustine and propagating orthodoxy. of the Ecumenical Council of Chalcedon. Greek; an influential author, theologian, and Christian bishop of Cyrrhus, Syria (A.D. 423-457). He played a pivotal role in many early Byzantine church controversies that led to various ecumenical acts and schisms. His friendship for Nestorius embroiled him, for a time, with his great contemporary, St. Cyril of Alexandria. Bishop of Agen, in Gaul, published a book against the Arians. He was a friend of St. Hilary of Poiters and a prominent figure at the Council of Rimini in 359. Also known as Philaster or Filaster, Spanish; Bishop of Brescia, he was one of the bishops present at a synod held in Aquileia in A.D. 381. St. Augustine met him at Milan about A.D. 383. He composed a catalogue of heresies (Diversarum Hereseon Liber) about A.D. 384. St. Pachomius, whom he succeeded in the year 349. He died in 380. His treatise on the monastic state is given by Galland. Italian; African by birth, on coming to Italy was appointed bishop of Verona, in the year 362. He died about the year 383. His works were collected after his death, at the beginning of the fifth, or at the close of the fourth century. The brothers Ballerini gave an excellent edition, in 1739, Veronae. Bishop of Milevis, Numidia, in Africa; from Augustine's writings we can assume Optatus was a convert; he is best known for his opposition to the heresy of Donatism. Also known as Marcarius the Younger, an extreme ascetic and disciple of St. Anthony ; he died, at an extreme old age, in the year 395., numerous miracles were ascribed to him. He presided over five thousand Nitric monks. (Severus Sanctus Endelechius or Endelechus), Christian rhetorician and poet of the fourth century, and a friend of St. Paulinus of Nola. Italian; became bishop around A.D. 387, theologian and author of many letters and sermons, held in high esteem by the people of Brescia. Patriarch of Alexandria from A.D. 385 until his death in 412, regarded as a saint by the Coptic Orthodox Church. also known as Victorinus Afer, (A.D. 390), a writer, grammarian, rhetorician, Neoplatonic philosopher and brilliant professor whose conversion in A.D. 355 caused a sensation at Rome. Obscure but strikingly original in his writings, he was an effective critic of Arianism and sought to present orthodox Trinitarianism in uncompromisingly Neoplatonic terms. His speculations about the inner life of the triune Godhead were to be taken up by St. Augustine. his homilies were renown in the Eastern Church in the sixth and seventh centuries. Sicilian by birth and lawyer from upper nobility, he published a very learned treatise against paganism about the year A.D. 348.